How protracted is your estimating process? How many stages does each project go through? The architect draws up the plans. Then somebody goes through the take-off process, analysing the drawings and specifications to identify the various elements and dimensions, converting everything to suit the RICS New Rules of Measurement (NRM) or Standard Method of Measurement (SMM). Then you still need to apply all your own trusted prices. Of course it’s a crucial stage of the job. Without a good and accurate list, the Bill of Quantities can’t be relied on as a guide for pricing. Or do you use the rule of thumb…or a square footage calculator… great as a rough guide but nothing more. OK there are plan wheels and digitizers that can link with your computer but it’s still not ideal. And yes, there are a number of products out there now offering digital take-off promoted as a way of reducing the time take on the take-off process to leave more time for the next job of cost estimating. But what if you could reduce both the take-off AND the estimating time? 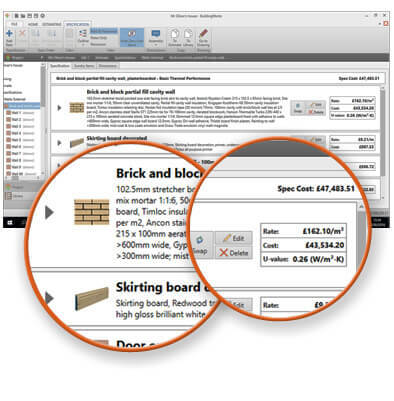 Well the BuildingWorks platform enables you to take-off and estimate all at the same time. There’s literally nothing on the market in the UK doing anything quite like this. Having set your scale, trace over the plan on screen. The good news – if it’s coloured it’s counted, so there’s no chance of missing anything. You also know as you trace, BuildingWorks has the ability to measure to thousandths of an inch, so you can be sure your take-off is spot on. …in order for it to price it at the same time. Yes literally as you draw, the ESTIMATE MODULE prices the job. You don’t need anything to ‘bridge the gap’ – no other gadgetry, app, tool, plug-in – the software is entirely integrated so the action is seamless. And if changes occur and they do, there’s need to search out the physical plan, or redo the take-off or redo the estimate. You simply go into the file, make the amendments, and the price will automatically update according to the alteration. and so much more valuable information. Think of your digital plan as a visual audit trail of the take-off, and perfectly complementary to the BIM process. 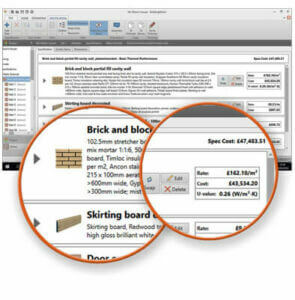 For more information on the take-off process using the BuildingWorks Design Module, and the estimate with the Estimate Module, visit www.getbuildingworks.com or give us a call on 0117 916 7880. Alternatively you can put the software through its paces with a 30-day trial!